Lots of fun raffle prizes and games! Ben Hart shares his knot-tying tips. Big winner Susan! 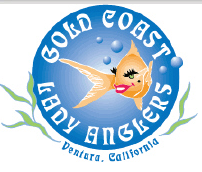 A $250 gift certificate for her SearcherSportfishing trip!